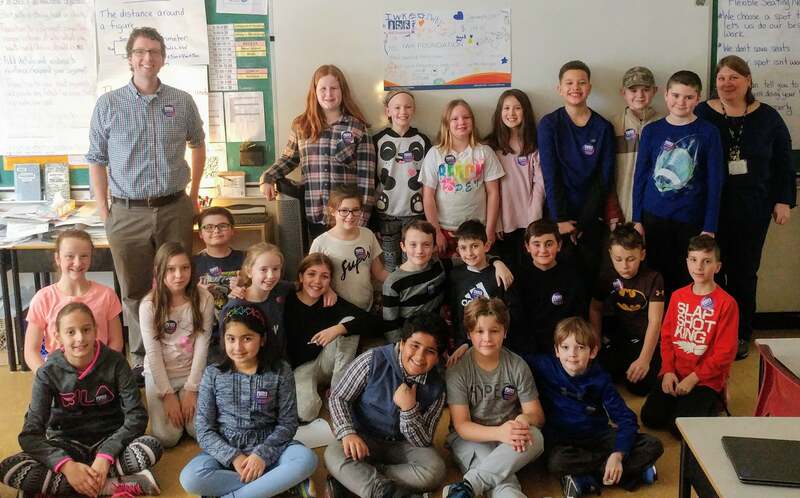 This guest post was written by Canadian grade 4/5 teacher, Jeff Hennigar. We are excited to share Jeff’s story and hope that it inspires you as much as it inspires us. You can follow Jeff on Twitter here. 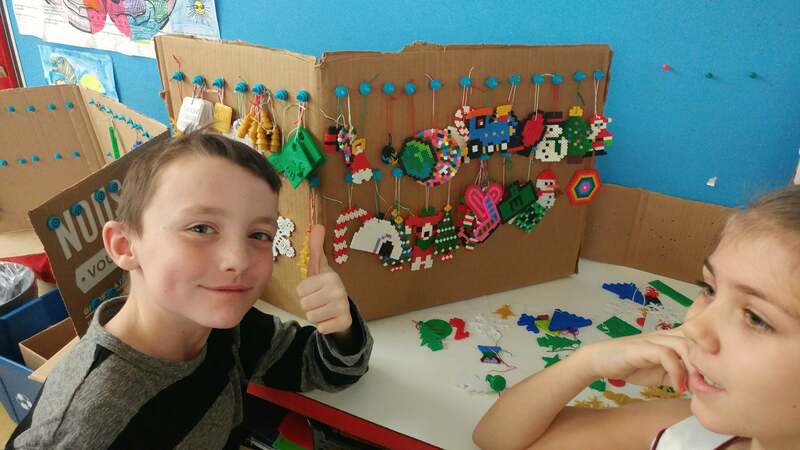 We held a Make Sale at BLT Senior Elementary School’s Christmas concert where we sold over 200 student-made 3D printed and Perler bead ornaments! 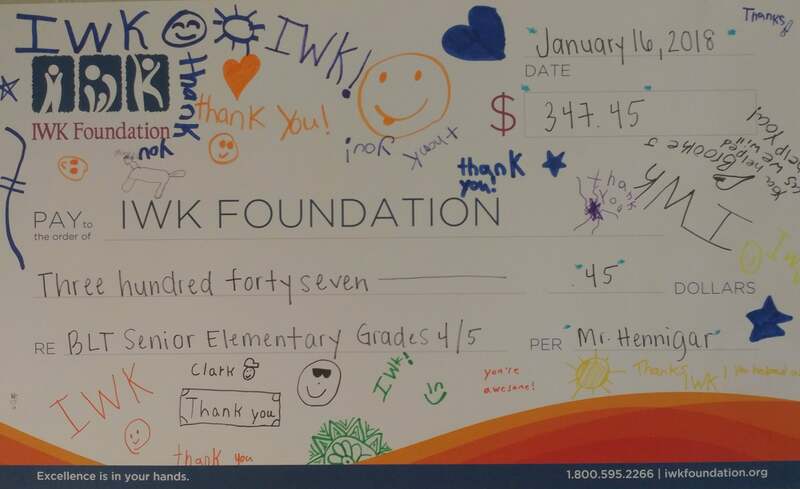 All the proceeds from the sale were donated to the local children’s hospital, the IWK Health Centre. We earned $347 for the hospital, a fantastic result! Last year, I received a few grants that allowed me to buy a SeeMeCNC Orion Delta 3D printer (Thank you to the NSTU & Brilliant Labs). It was new to both me and my students. 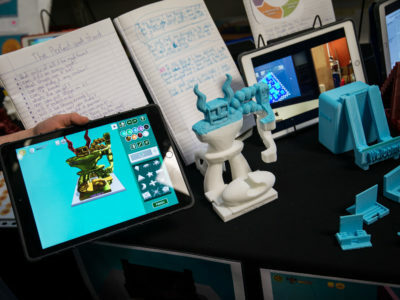 As anyone that has tried 3D printing can contest, there is a pretty big learning curve for teachers – more so than there is for the students! Admittedly, I spent many hours learning how to use the printer properly. We completed several whole-class design projects including personalized key-chains, Sphero accessories, and free-choice designs. My students loved having the printer in our classroom. It was teacher-centered: I was the person responsible for using the print software and keeping it printing. Slow turn around: with only one printer, we would be printing projects for 3-4 days to get the student’s items printed! In August of 2017 I found out I was accepted to take part in the GE Additive Program – a grant program for teachers that was providing over 400 schools around the world with a 3D printing kit designed to help teachers integrate this technology into their classroom. With the web-based Polar Cloud software, students have access from any device to queue print jobs, and I don’t have to do a thing! The Polar Cloud is synced with all 3 of my printers, so we can now get student projects printed MUCH faster. 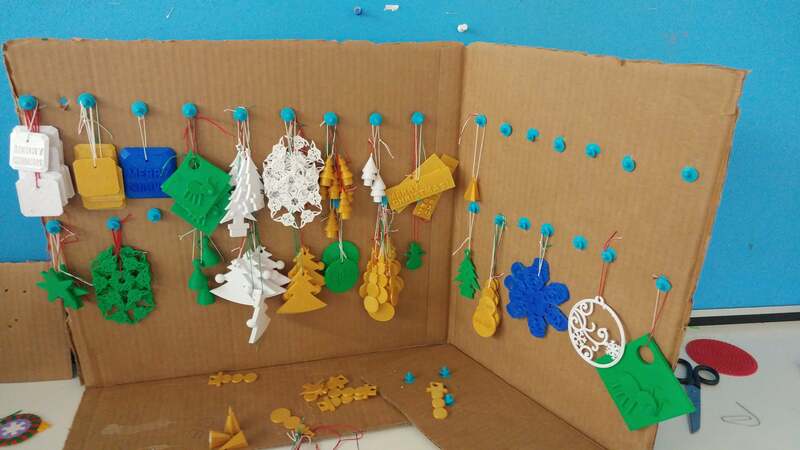 Inspired by a friend in Kingston, Nova Scotia, I decided to follow his lead and have my students design and print Christmas ornaments as our main launch into 3D design. We started designing using TinkerCAD. Nick and I even arranged for small groups from our classes to have a Google Hangout so his students could teach mine how to make a Christmas tree in TinkerCAD. But like any tool, TinkerCAD wasn’t ideal for some of my students. Students struggled with tasks such as resizing shapes to scale and positioning objects. I decided to try Makers Empire, one of the apps recommended by the GE Additive program. If you haven’t tinkered with Makers Empire, it’s an app for iOS, Android, Mac, and Windows that is designed specifically for K-8 students. 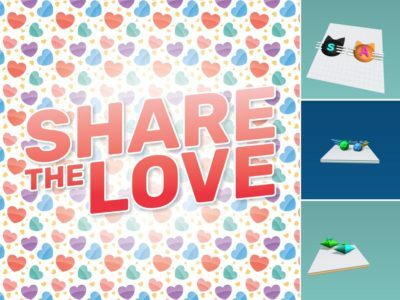 The app is gamified to increase student engagement–they receive points for completing design challenges and trying new tools. Like the Lego Life app, students can post their designs for other users to view and leave comments. 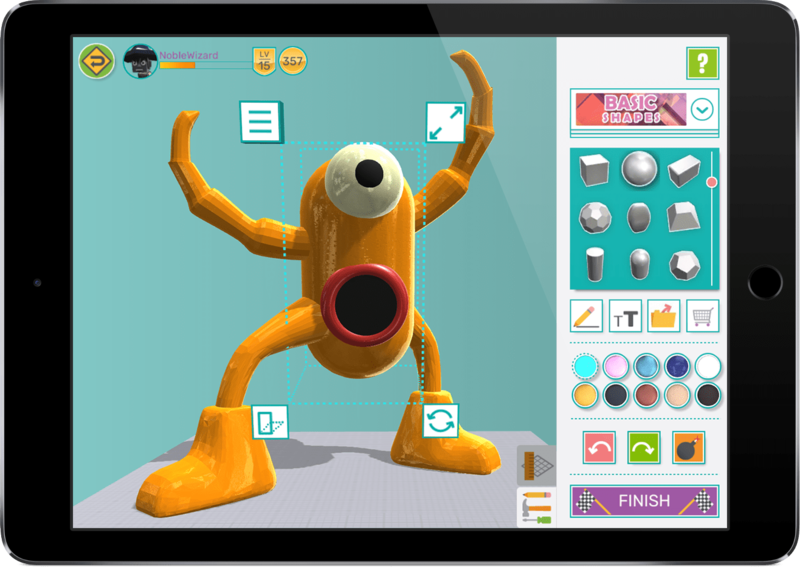 My students were immediately drawn to Makers Empire, an app that was designed for kids more than TinkerCAD. 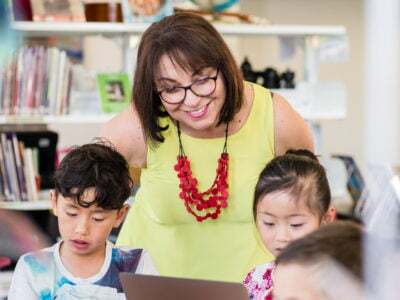 The teacher’s dashboard is also very useful, and student’s work is automatically sent to the Polar Cloud for easy slicing and printing. We were planning to design flat ornaments, so the “flat shapes” library in Maker Empire’s Shaper tool was a perfect fit for our needs. 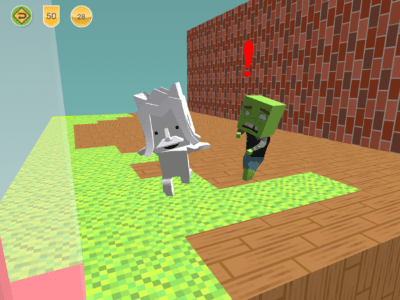 In the Blocker module, students can create models that feel like designing in MineCraft. We had a few block Christmas trees for sale that were a big hit! I had most students interested and invested, but this was a class project so I needed everyone on board! So what was missing? What was I overlooking? I had neglected to offer a choice of medium. Some students weren’t interested in designing 3D models and mass producing their designs. I needed to have options for students to create that preferred to work with their hands. Enter: Perler Beads! For the next 4 art classes, our classroom was run like a Makerspace. There were always different activities happening in each pocket of the room. 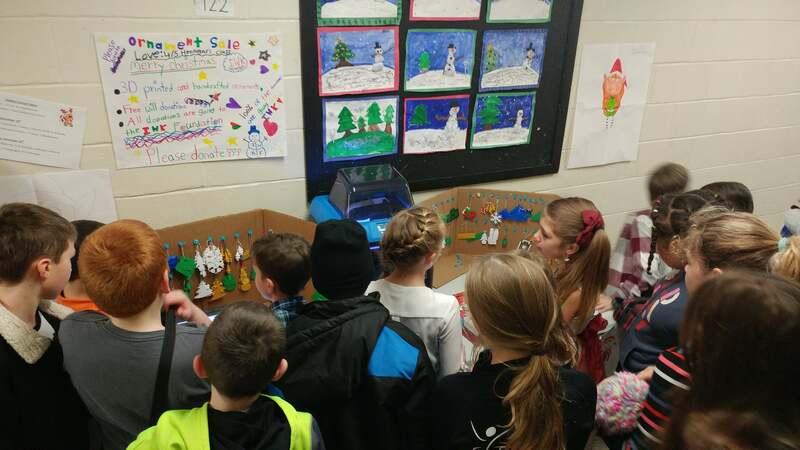 3D designing, monitoring the 3D printers, Perler beads, stringing ornaments, or making displays all while singing along to our favourite Christmas songs! As the event came closer, we focused on sharing our project with the school and community. Some students made posters while others wrote scripts to inform other classes about what we’ve been doing. A group even wrote the notice that was sent home so parents would know to bring some change. After debating prices, we decided that we would sell our ornaments as free will donation. No limit on how many ornaments you can take, no minimum cost to buy. 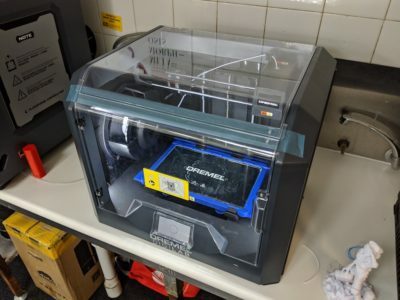 Since GE Additive supplied us with filament, we had $0 in overhead costs! We didn’t need to worry about making “at least” any certain amount. We could provide work we were proud of and share it with the community for whatever they could give. The holidays are a hard time of year for many of us, and we wanted to respect that. We set up a table in the hall outside the gym with our Flashforge Inventor II (my favourite printer) printing an oversized version of an ornament designed by one of my students. We had more than 200 ornaments ready to sell and a schedule of students ready to get us through the day. As predicted, we were getting a wide range of donations. The first donation of the day was $10, and the second was $0.10. After the concert was our busiest time! My students were smiling ear to ear as excited adults and kids surrounded the table to buy ornaments. It was a very powerful moment for my students! I’m so glad I was able to be there to see it. The project gave us a mutual goal to work towards, and the class worked so hard to make it a great success. A few weeks before the sale I read a blog post linked from Twitter by Tom Murray called “No. 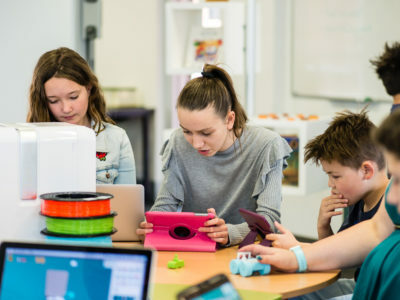 Your 3D Printer Does Not Make You Innovative.” Basically, Murray outlines four different ways 3D printers are used (and not used) in schools. I feel like if Tom came into my class within the last two months, we would fall into his MVP Printer category; “MVP Printers being used in schools are worth every penny. They are viewed as a conduit for learning, not as the learning experience itself.” The challenge will be to keep it that way. We sold over 200 student-made 3D printed and Perler bead ornaments! All the proceeds from the sale were donated to the local children’s hospital, the IWK Health Centre. We earned $347 for the hospital, a fantastic result! Jeff Hennigar is a grade 4/5 teacher in Halifax, Nova Scotia, Canada. 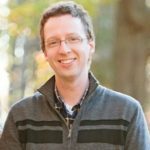 He is a Google Certified Educator (level 2), Breakout EDU Authorized Trainer, CoSpaces EDU ambassador, and maker of many mistakes. He is driven by a passion to ensure that his students want to come to school every day! 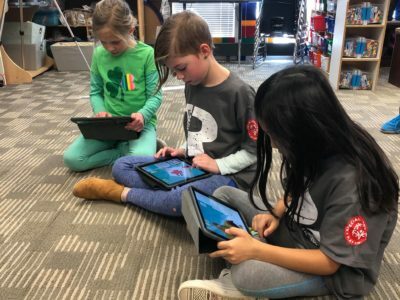 Through his use of educational technologies, games-based, project-based, and student-led learning, he’s getting closer to reaching his goals for student engagement and empowerment.